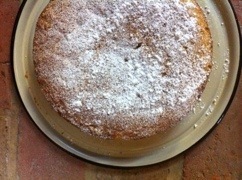 I learned about olive oil cake a couple of years ago, and have always been intrigued by various descriptions. I’ve never been someone who craved dessert. I’m happy with a piece of fruit or nothing at all after dinner. 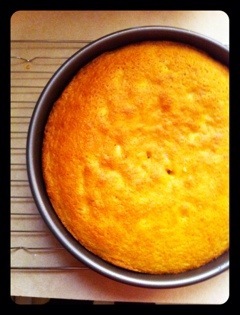 Olive oil cake isn’t overly sweet, and the sweetness you do experience is bright and laced with citrus. I looked for awhile until I came up with a recipe I was willing to put any effort into. 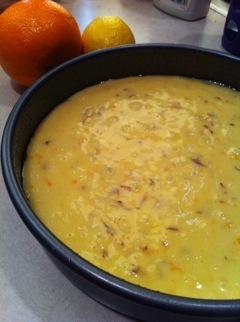 I was especially drawn to recipes calling for citrus zest and almonds. I tried a few out, and liked The Food Network’s Giada De Laurentiis’ recipe the most. Neither an avid nor particularly good baker, I knew I had to be doing something wrong, but I couldn’t figure out what exactly. I retraced my steps. Did I forget anything? Did I add something I wasn’t supposed to? He suggested I halve the baking powder. That’s it. I have to admit I was skeptical. There is no way that could make such a difference. I am here to tell you there is a way, and it is the right way. I’ve made this cake about six times in the past month, and it is perfect every time. Remember, I am not a “dessert person”. So I just have a slice of this for breakfast with coffee. If you have a chance, go say hi to the nice people at Hi*Rise. The photos top to bottom are the cake cooling; the cake right before serving dusted with powdered sugar; and the batter (I’d recommend following the recipe and actually chopping the almonds, I spaced out and it was too late! ).